We can be called alive in those moments, when our hearts are conscious of our treasures. When life gets hectic and you begin to feel overwhelmed, take a moment to focus on the people and things you are grateful for in life. When you are grateful, other things will fall by the wayside. For example, you probably won’t be able to feel jealous and grateful at the same time. You might even be thankful for someone else’s success or their contribution to you. Being thankful gives you perspective on you situation and brings you to the present moment. One of the most impressive reasons for being grateful is the positive impact on the way you think and feel. Research shows that grateful people have, “higher reported levels of the positive states of alertness, enthusiasm, determination, attentiveness and energy . . .” You will find a positive emotional state by simply focusing on the parts of your life that you are most thankful for. Appreciate the abundance in your life. Being grateful is an energizing way to start your day and a relaxing way to end it. Tony Robbins suggests to list out all the things you are grateful for as you warm up for your morning exercise. Deepak Chopra has incorporated gratitude exercises into his guided meditations. Swamiji has added similar techniques in his guided meditation; Nithya Dhyann. Feeling gratitude is an important practice that I have brought into my daily routine. I notice that it has improved my emotional wellbeing and general happiness. Sometimes a quick visual reminder is all you need to bring you back to a place of thankfulness and abundance. 1. Gratitude Journal: Each evening you can list the things for which you are grateful. Start with just five things. You will soon see that your list is much longer than you expected. Personally, I have found that the best part of a Gratitude Journal is the record it creates; pages and pages of my personal history of abundance. 2. Gratitude Rock: Find a rock that feels good in your hand. Name it your ‘gratitude rock’, carry it with you along with your keys and wallet. The idea is to remember and say “Thank You” for something in your life, each time you touch or see the rock. For example, when you empty your pocket at night; when you pack up your things in the morning; when you reach for your keys. An actual rock is not necessary; you can use anything small as a figurative representation. My mother uses a cute little keychain as her gratitude rock. 3. Gratitude Beads: Collect a short string of unique beads, and give significance to each one. As you run your fingers through them, with each bead, think of one thing you are grateful for. If you use beads in this way, gratitude can be a bridge to meditation and peace. At bedtime, instead of thinking peaceful thoughts and resting, my mind may be overtaken with all the things I have left to do. Running my fingers over gratitude beads allow me to focus on my many wonders and blessings as I go to sleep. 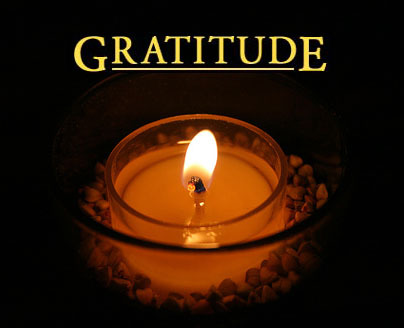 Here are five little things we can do each day to nourish our sense of gratitude: 1. Choose your friends wisely. If you strive to be spiritually strong, supportive, empowering, intelligent, energetic, and positive, seek those characteristics in others. Help your friends develop more positive traits by living those positive traits yourself. Know what kind of friends will help you nurture your soul, and set out to find some. 2. Help your friends cultivate gratitude. Before you say anything about a friend's situation, remember that everyone's situation is unique. I've seen it happen to myself and to my friends. They'll be perfectly happy until someone tells them they're being mistreated. Suddenly, they're upset. Don't let your friends wield such power, and work to avoid wielding such power yourself. Day by day, hour by hour, make a goal to stop complaining about your life. Make a pact with your friends to cut the complaints from your conversations. 3. Give the gift of gratitude to your children. Help your children to be satisfied with the simple things while giving them the innate power and ability to achieve whatever they want in life...by living in such a way yourself. 4. Say "Thank You." Whom in your life do you appreciate? Let them know, whether it's your mom, your kids, your friends, your husband, your child's daycare provider or the helpful woman behind the cosmetics counter. A heartfelt "thank you" often does the trick. Make it a habit and your attention will suddenly turn to all the things people do for you. Also, write thank you notes regularly - not just after a gift exchange - and be mindful of all the ways you show your appreciation by the things you do in return. Another idea: Spend 15 minutes writing a letter to your children. In this note, tell them how much you love them, why you're thankful for them, and all the ways they have enriched your life. This can be something you give them now or after they have grown. 5. Be mindful of the little things. Today, strive to be aware of all the aspects of your personal, professional, and family life for which you are thankful. Take a few minutes today to appreciate nature. Go for a walk and notice only those things that are beautiful. Whether you focus on the stars above, a distant mountain range, or the cottonwood tree in your backyard, try to notice the details. Give thanks for the beauty that surrounds us.